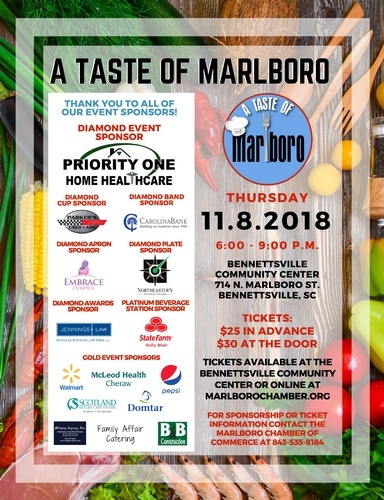 The 8th Annual Taste of Marlboro will be held at the Bennettsville Community Center on Thursday, November 8th from 6:00-9:00 pm. Local chefs will provide samples of their signature dishes and drinks during this highly-anticipated event. The Taste of Marlboro provides an opportunity for both amateur and professional chefs to show off their best recipes to the community, while attendees enjoy fellowship, music, and delicious food offerings. Opportunities to serve as a chef for the Taste and sponsorships are available. Tickets are $25 per person in advance. Limited tickets will be available at the door for $30. Individuals must be 21 or older to purchase tickets; because libations will be served, no one under 21 will be admitted. The number of tickets will be limited to 300. Participants are urged to purchase tickets as soon as possible. Business casual attire required. For more information on serving as a chef or to purchase tickets, contact the Marlboro Chamber of Commerce by calling 843-535-8184.